When it comes to cuisine, three-star Michelin Chef Pierre Gagnaire says, “The dishes have to be well assembled, easy to understand and possess eccentricity. And, of course, they have to be delicious.” On December 4, 2009, Gagnaire opened his first restaurant in the United States at Mandarin Oriental, Las Vegas. Twist boasts an innovative menu that infuses the simplicity of classic French cuisine with a modern spin – a fusion for which Gagnaire is revered in today’s culinary world. Twist is Gagnaire’s second restaurant within Mandarin Oriental Hotel Group as his first, Pierre, is located at Mandarin Oriental, Hong Kong. Born in Apinac, France, Gagnaire is the Head Chef and owner of multiple Michelin-star restaurants worldwide, including establishments in his native France as well as London, Hong Kong, Tokyo, Dubai, and Korea. Although his food is often described as modern, his style is deeply rooted in the French cooking tradition. Gagnaire’s innovative creations, while refined and exquisitely presented, are both easy to understand and unpretentious. 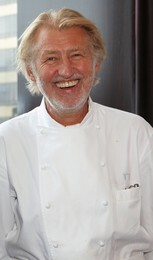 In 2001, Gagnaire co-founded the molecular gastronomic dining experience known as “Note à Note” with French chemist, Hervé. Offered exclusively at his restaurant, Pierre, at Mandarin Oriental, Hong Kong, “Note à Note” is claimed as the world’s first dish made entirely of pure compounds. The process, referred to as “culinary constructivism,” involves separating pure compounds found in natural ingredients, such as glucose and citric acid, and combining them with substances to alter their natural form and texture. The result is unique, offering diners familiar flavors with a new consistency and appearance. To fully understand Gagnaire’s perspective, one must have what the master chef calls “intelligence of the senses,” in addition to curiosity and freedom of spirit. Moreover, his food is continually evolving, as are his passion and inspiration. In sum, Gagnaire asserts, “I want to put emotion and intelligence into every one of my dishes. Corkage Fee: 95.00 | Per 750ml bottle. 2 Bottle Max.